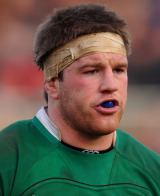 Sean O'Brien took the long way round to becoming a regular with Leinster, progressing through the ranks of Tullow Community School, Tullow RFC and then the Irish Youths before winning an academy contract in 2005-06. A dangerous, aggressive flanker or powerful ball-carrying No.8, he made an immediate impact on the openside and won recognition with Ireland 'A' and the full Test side at the end of 2009. In November 2010 he made a first Test start against Samoa at Lansdowne Road, but it was his Heineken Cup form for his province later that season that sounded alarm bells that a major talent was emerging. Scoring four tries in Leinster's six Pool games, he also ably deputised for Jamie Heaslip - and not just at provincial level because he was entrusted with the Ireland No.8 jersey for the Six Nations opener against Italy in Rome in February 2011. Heaslip returned for the following week's encounter with France but O'Brien's services were retained by head coach Declan Kidney, who switched the versatile Carlow native to blindside flanker, thus underlining his growing importance to the current Ireland side. And O'Brien found himself in the 30-man squad for the World Cup despite being injured going into the warm-up Tests. O'Brien played in all six of Ireland's games in the global gathering as they were knocked out at the quarter-final stage of the tournament. He went on to play in four of Ireland's five matches in the 2012 Six Nations. O'Brien continued his strong form into the following season and after being one of Ireland's better players during the 2013 Six Nations, he was selected for the British & Irish Lions squad.